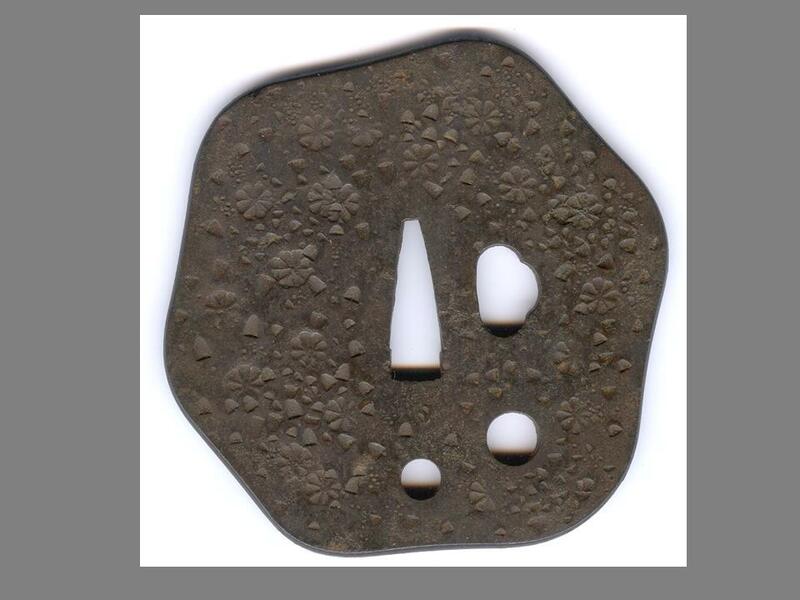 Ko-sukashi: in negative relief, where a minor design is cut into the plate (e.g. 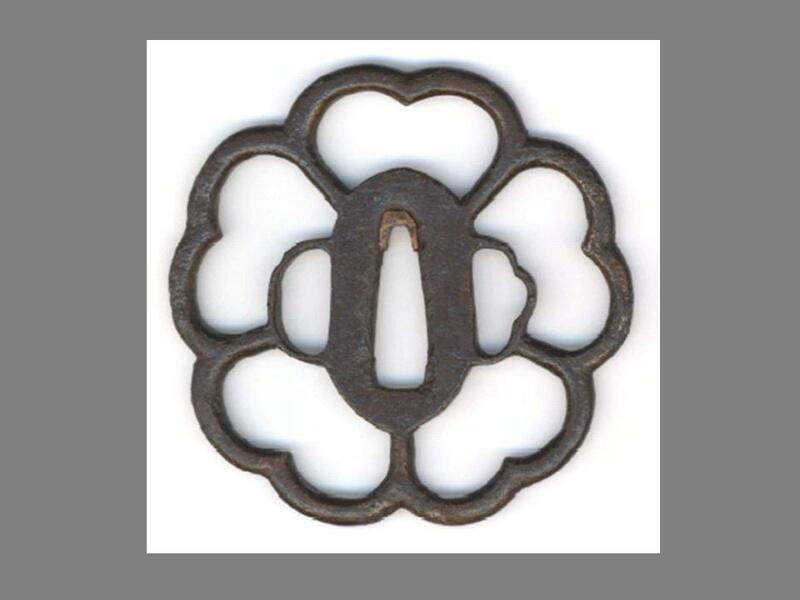 a cherry blossom); these tsuba were often produced by swordsmiths (tosho) or armour-makers (katchushi or kacchushi), however many were also produced by tsubako of different schools and signed. 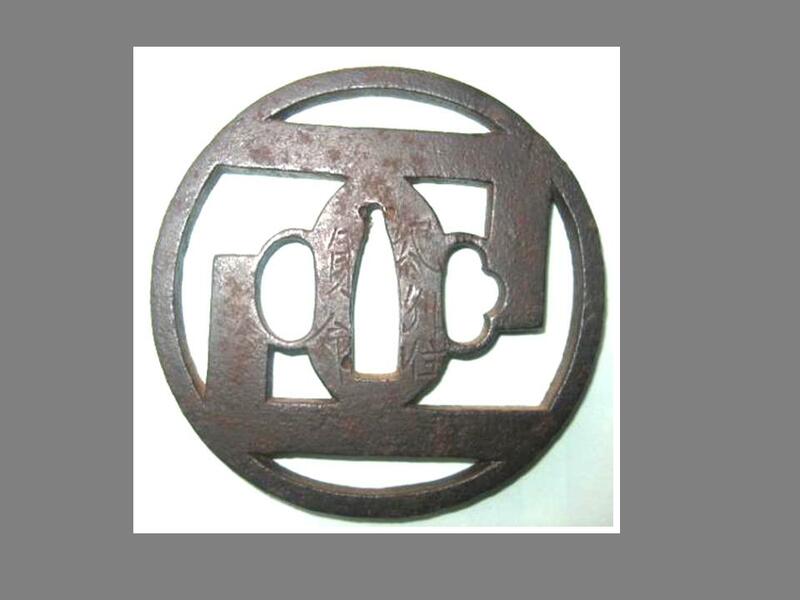 Ji-sukashi: in positive relief, where a large amount of the plate is removed, and the design is formed by the plate that remains. (b) kage-sukashi, a type of negative silhouette where only the outline of the design remains, such as with a pencil drawing. There were many different “schools” or groups, but maybe 5-6 fundamental styles. 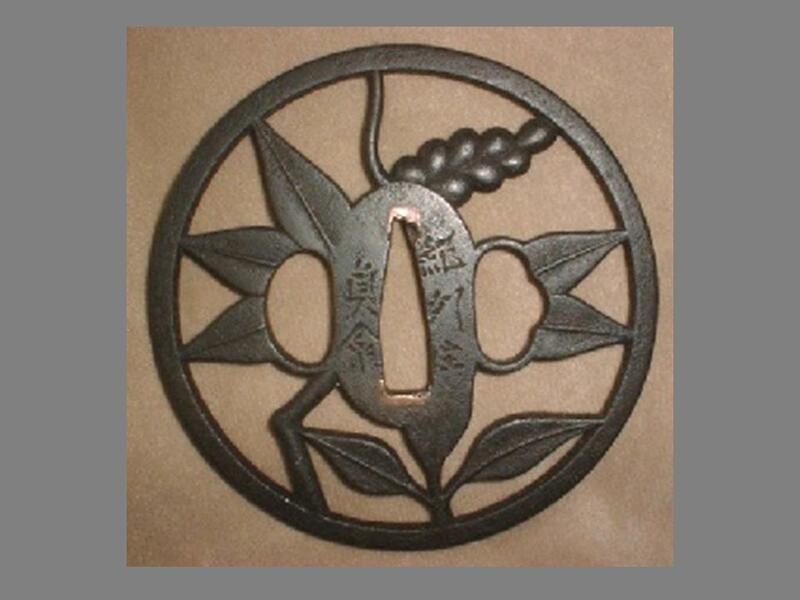 As tsuba makers (tsubako) moved around over time, many tsuba are transitional between styles. 5. Higo: Hayashi, Hirata, Shimizu, Musashi. 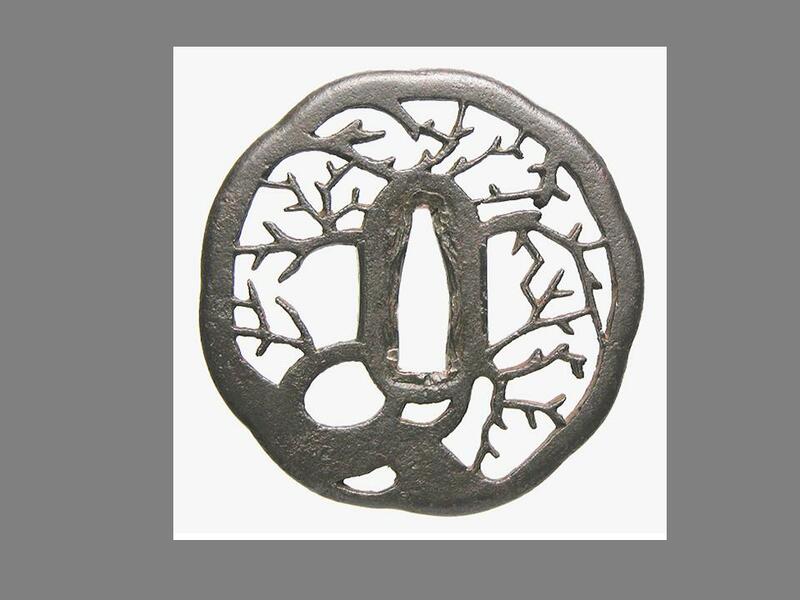 there are many groups that produced tsuba in soft metals often with gold highlights (kinko). 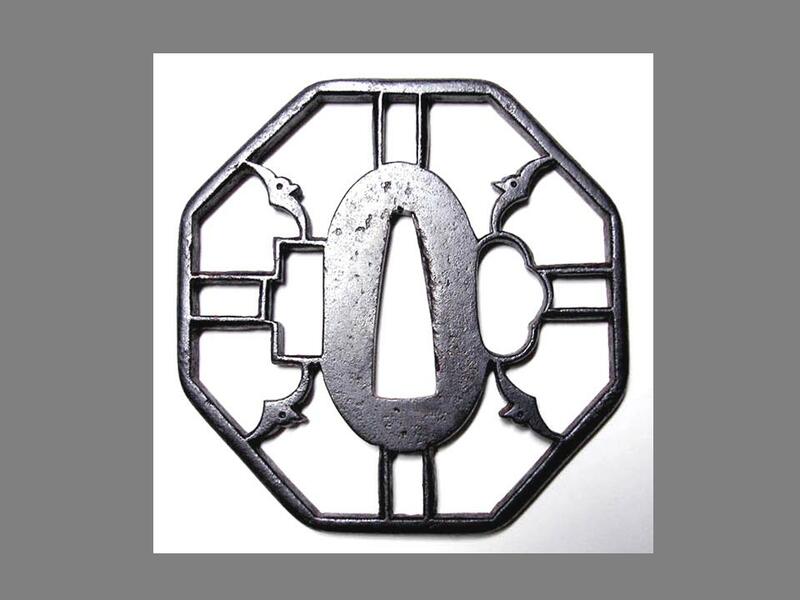 A comprehensive list of tsubako groups by Jim Gilbert is available in The Japanese Sword Guide of Dr Richard Stein: Major Schools of Tsuba Artists. Some descriptions and interpretations in the following gallery may need confirmation. 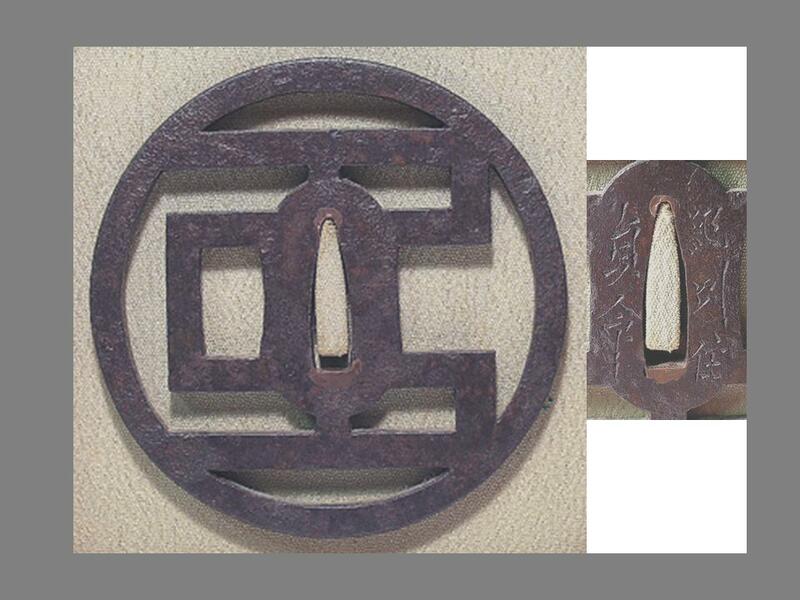 Very large flat iron plate (ita gane) tsuba, kobushi gata (shape of closed fist), largest dimensions 10.8 x 10.4 x 0.5 cm, stamp of 8 petal flower, U-shape punch, and groups of pointed punch marks. Kaku mimi, suhama-shape kogai hitsu ana, two udenuki ana (holes for sword wrist cord), quite heavy. Probably very late Edo. 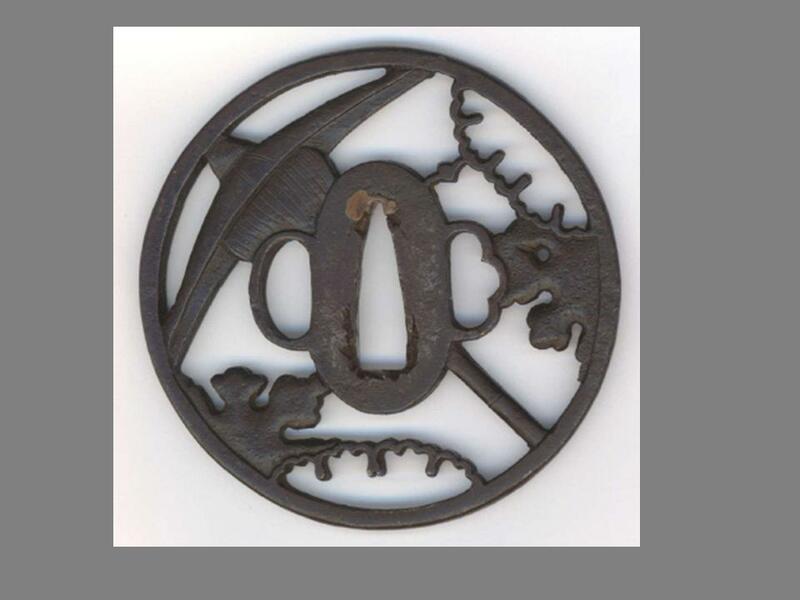 Katana size tosho tsuba, maru gata, maru mimi and plate thins towards the edge, kozuka hitsu ana, clean ko-sukashi design of oar and conch shell (horagai), 7.8 x 7.8 x 0.3 cm, mumei, late Edo period. 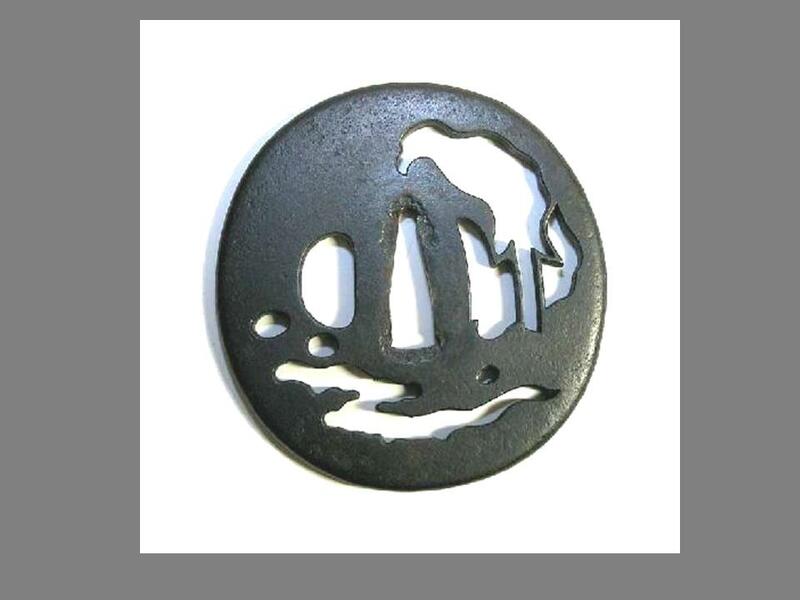 Katana size tosho tsuba, maru gata, maru mimi, kozuka and kogai hitsu ana, design of clouds, rain? and flying birds, 7.1 cm, mumei, late Edo period, probably tsubako work. 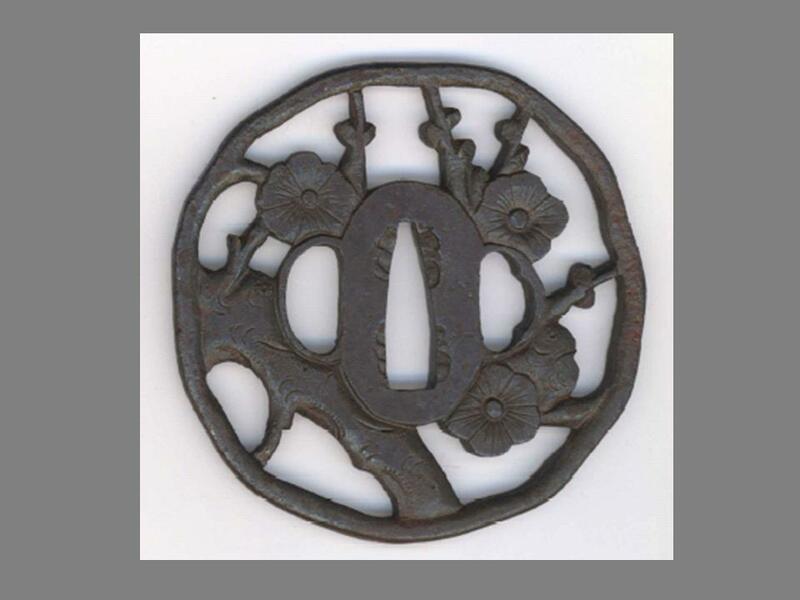 Katana size plate tsuba, maru gata, maru mimi, two hitsu ana, well balanced ko-sukashi design of seven sakura flowers, 8.7 x 8.6 cm, mumei, late Edo period. 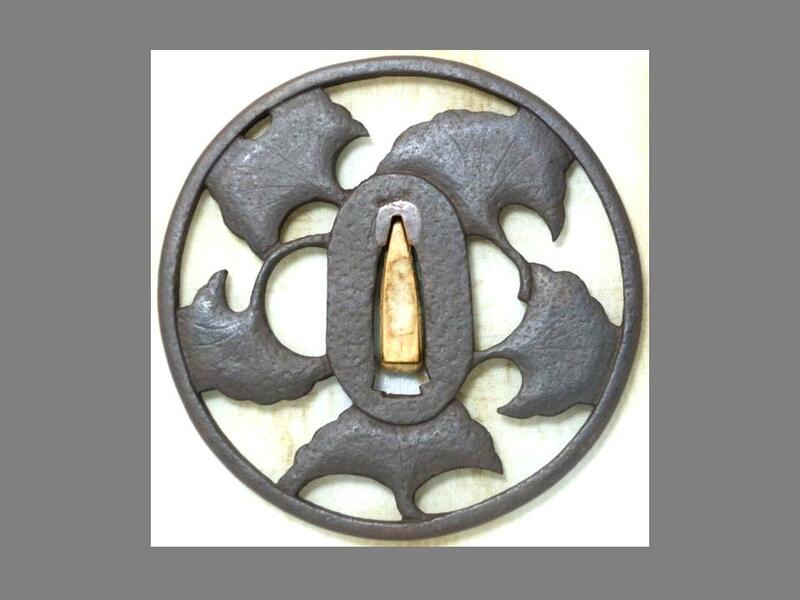 Tosho tsuba, maru gata, maru mimi, kozuka hitsu ana, katana size 7.5 x 7.5 x 0.45, ko-sukashi design of one long tomoe (comma) and a ko-sukashi sakura blossom, mumei, late Edo period. 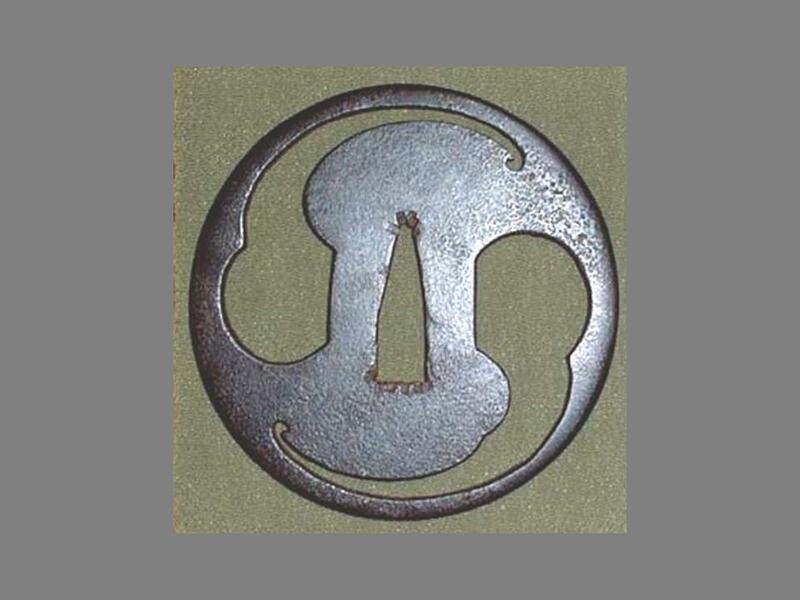 Ita gane tsuba, maru gata, maru mimi, kozuka and kogai hitsu ana, 8.0 x 7.9 x 0.45, ko-sukashi design of two tomoe (comma), attributed to Kamiyoshi Ha of Higo, late Edo period. 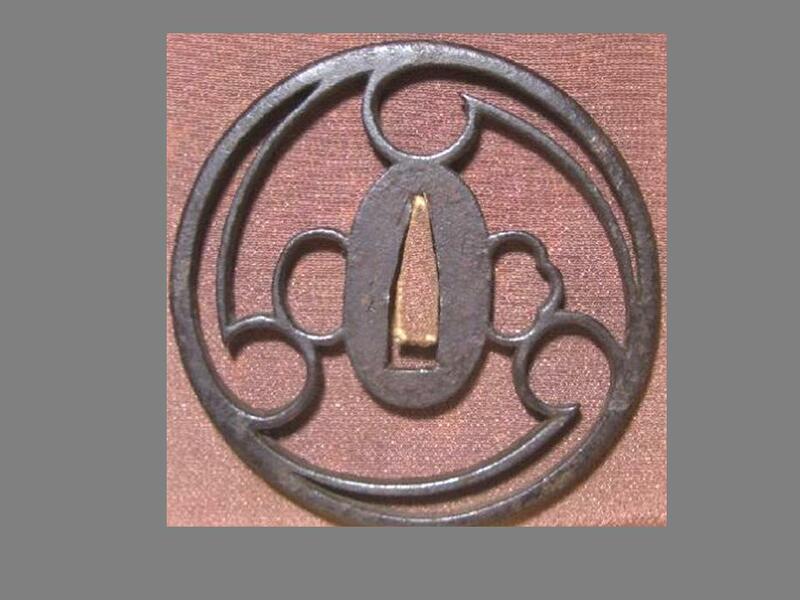 Early Edo katchushi mumei tsuba, 7.8 x 7.7 x (2.8 and 2.5) cm. Pattern of plantain leaves (omodaka) and axe. Omodaka is often found as a mon. Maru gata, dote mimi (thick) and one hitsu ana. Omodaka is also called shogungusa (shogun grass). 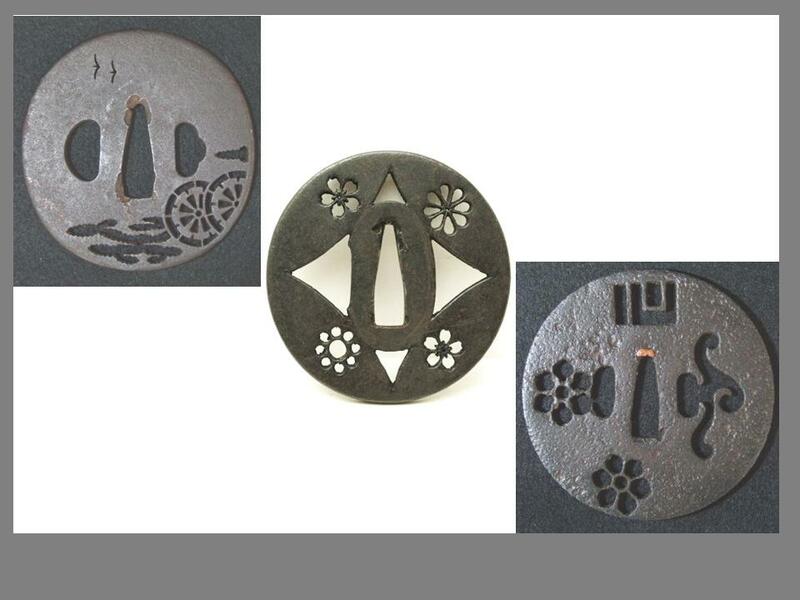 Selection of tosho ita gane (iron plate) tsuba with ko-sukashi designs, maru gata with maru mimi. 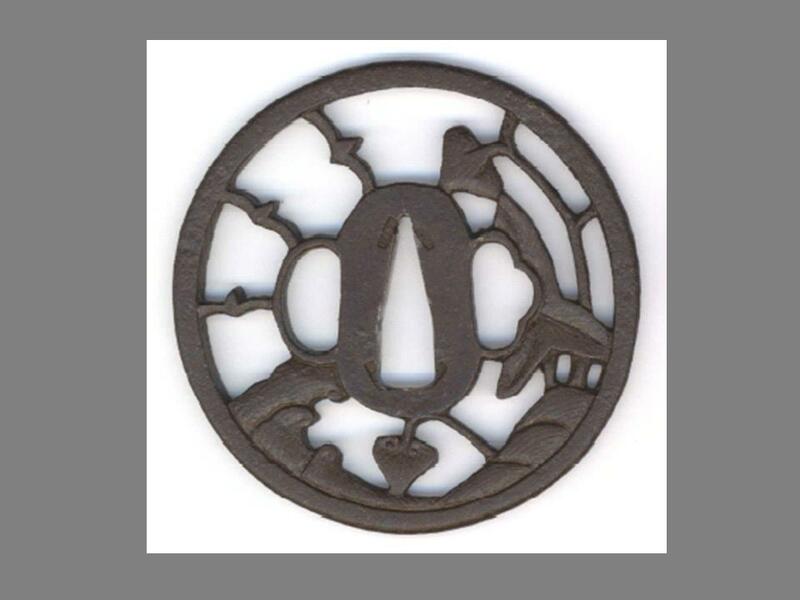 These tsuba are typically mumei and were practical items for use, and often the sukashi design represented a familiy or clan kamon. All are Edo period. 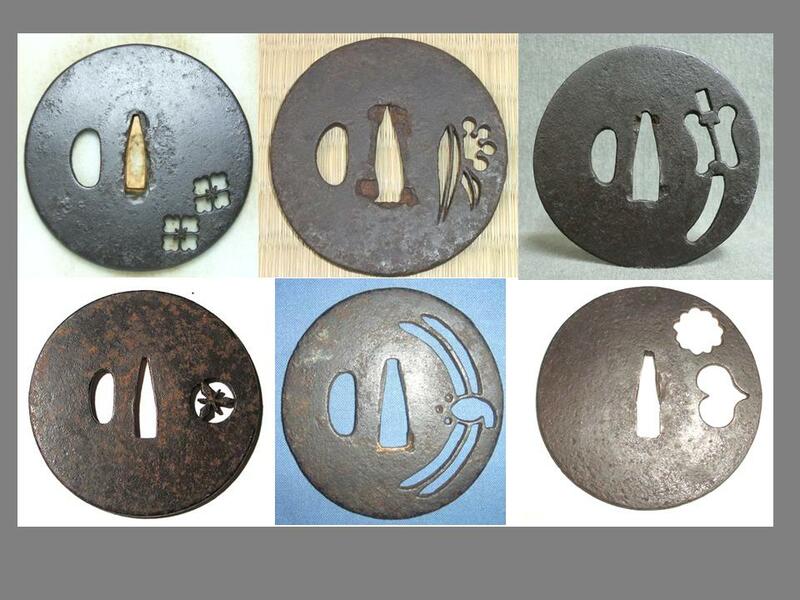 From top left, A: kamon, Chinese flower (karabana) 7.4 cm; B: flowers and leaves, 6.9 cm; C: General’s baton/fan (gunpai), design or mon (sometimes this is referred to as an umpire’s fan, as in sumo), 7.9 cm; D: kamon, teaberry (chanomi), 8.8 cm; E: dragon fly (tombo) design or mon, 7.1 cm; F: heart or inome “boar’s eye” and bright star, 8.5 cm. 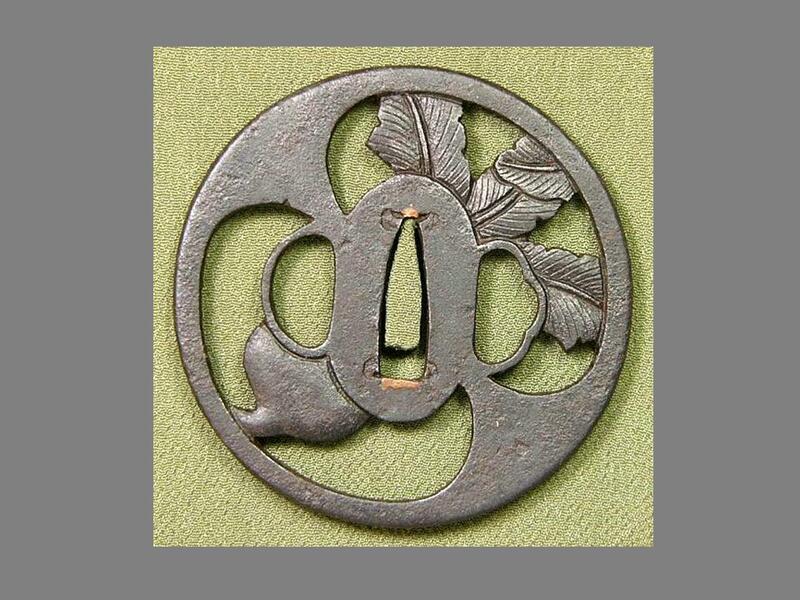 Tosho ita gane (iron plate) tsuba with ko-sukashi designs, maru gata and maru mimi, Edo period. From top left, A: kamon, diamond flower (hanabishi) 7.4 cm; B: design of conch shell (horagi) with two udenuki ana (cord holes), 7.7 x 7.4 cm; C: kamon, 5 lobes of cloves? 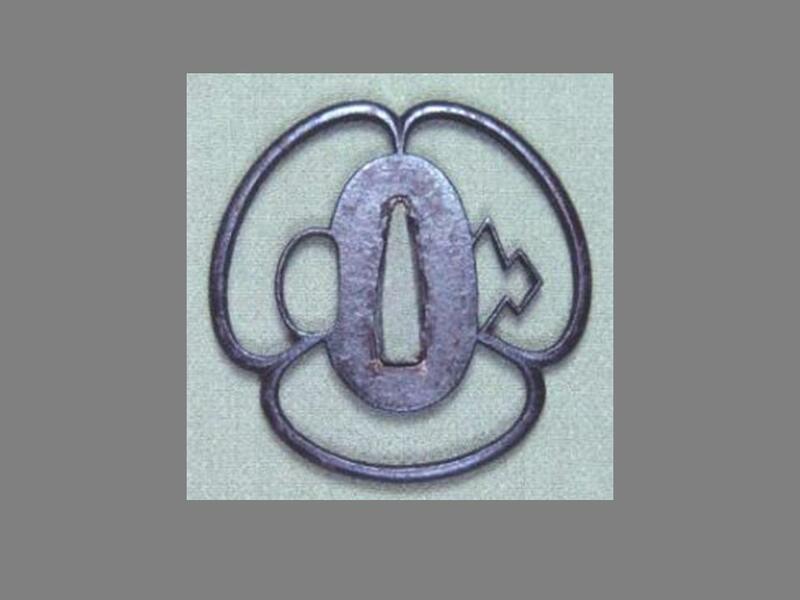 (choji), two udenuki ana (cord holes), 8.1 cm; D: kamon, 6 lobes of cloves? (choji), 6.9 cm; E: kamon, umbrella in the rain (kasa ni ame), 8.7 cm (this could be early Muromachi, see Sasano p. 33); F: kamon, oxalis (katabami), 6.9 cm. 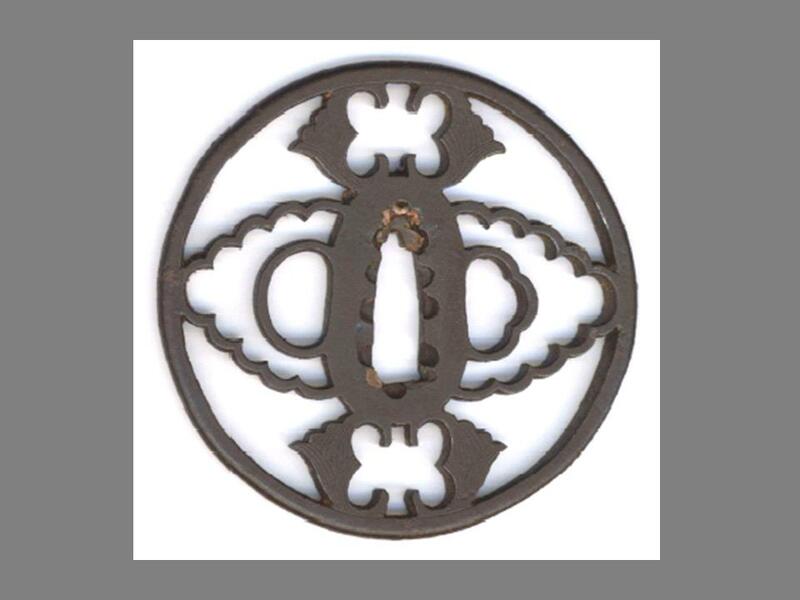 Tsubako ita gane (iron plate) tsuba with ko-sukashi designs, maru gata and maru mimi, Edo period. From top left, A: design of cart wheels (kuruma; also a kamon), water and flying birds, 7.0 cm; B: kamon of two sakura and possibly two versions of 8-petal chrysanthemum (kiku) 7.0 cm; C: kamon of 6 petal flower and angular design (key? or a version of gengiko 5 incence sticks? ), plus wave/cloud? design, 8.7 cm. 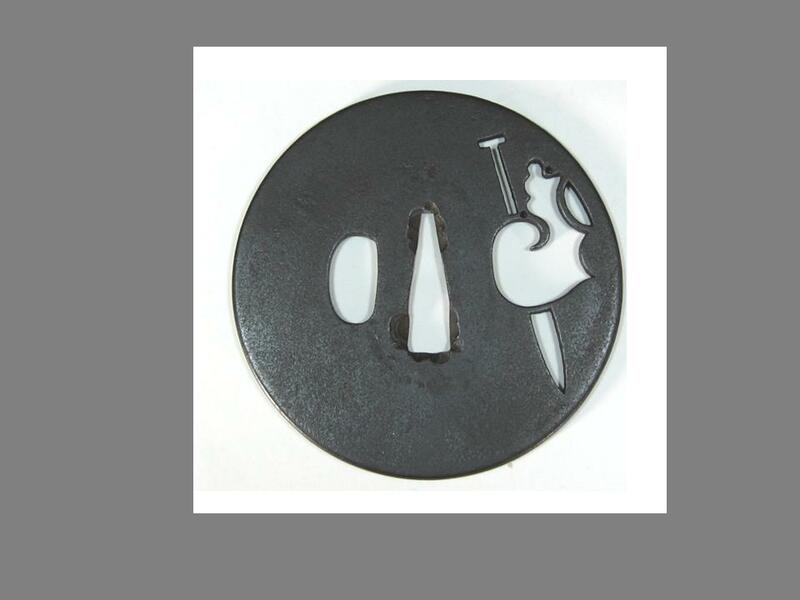 Otafuku gata tsuba of wakizashi size, 6.6 x 6.0 x 0.3 cm. Ita gane plate that thins towards maru mimi. Kozuke and kogai hitsu ana. Mumei, but could be later Akasaka. 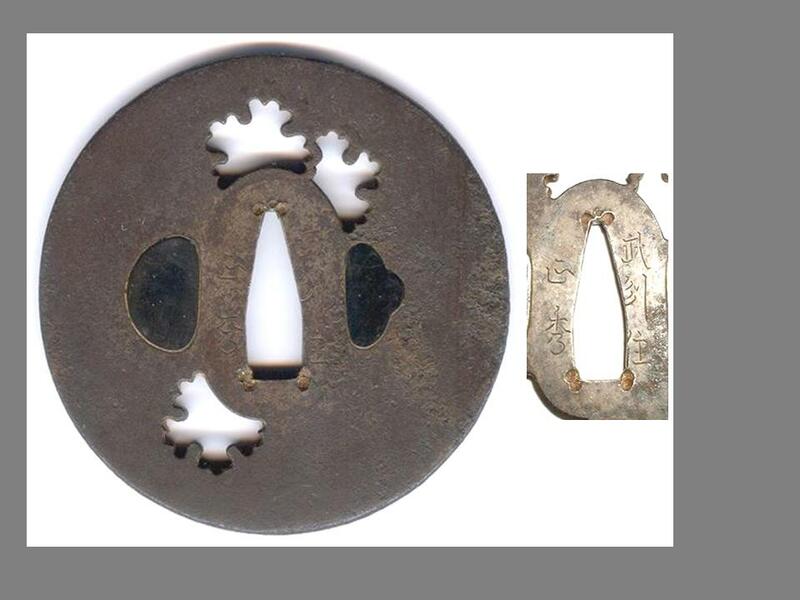 Ko-sukashi design of two pairs of small and large holes. These represent kukurizaru (kukuri saru) , or “tied monkeys”, which express the philosophy of control of one’s ego (as in restraining a boistrous monkey). Small stuffed cloth figures of monkeys on a string with arms and legs tied are sold at many temples. 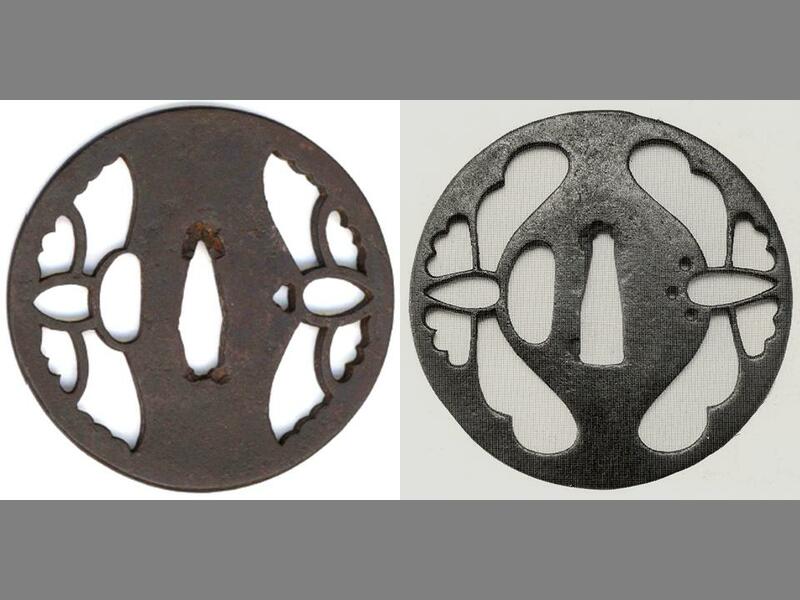 On right are other versions (in Tsuba-no-Bi), top mid Muromachi kacchushi tsuba (#74); bottom late Edo period “Kofu Ju” “Akao Saku” (#160). 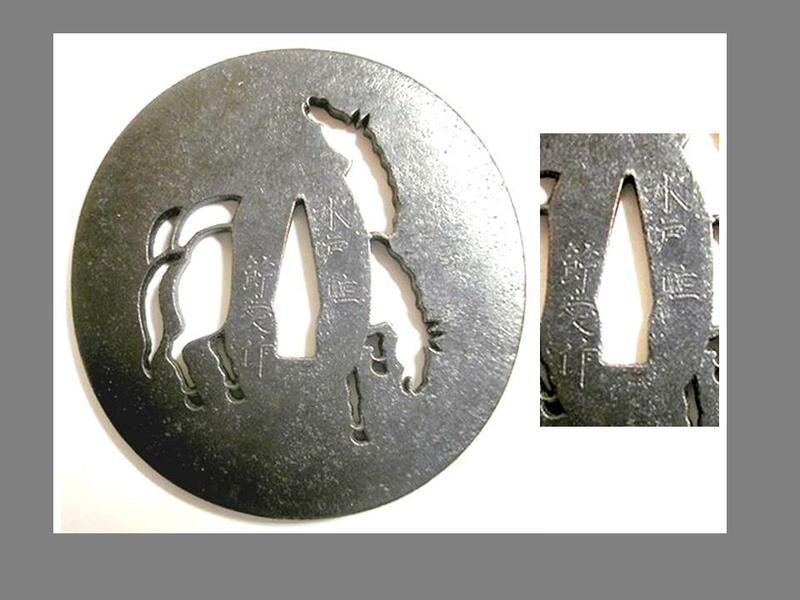 Large tsuba katchushi made, maru gata 9.3 x 9.3 cm, maru mimi, rather thin 0.2 cm, ko-sukashi design of kanji in form of a Buddhist prayer (daimoku); “namu ami dabutsu” here abbreviated to the 4 characters (right to left) “na mu a mi”. Mumei, probably late Muromachi-Momoyama. Also pair of hearts or boars eyes. There is no hitsu ana. 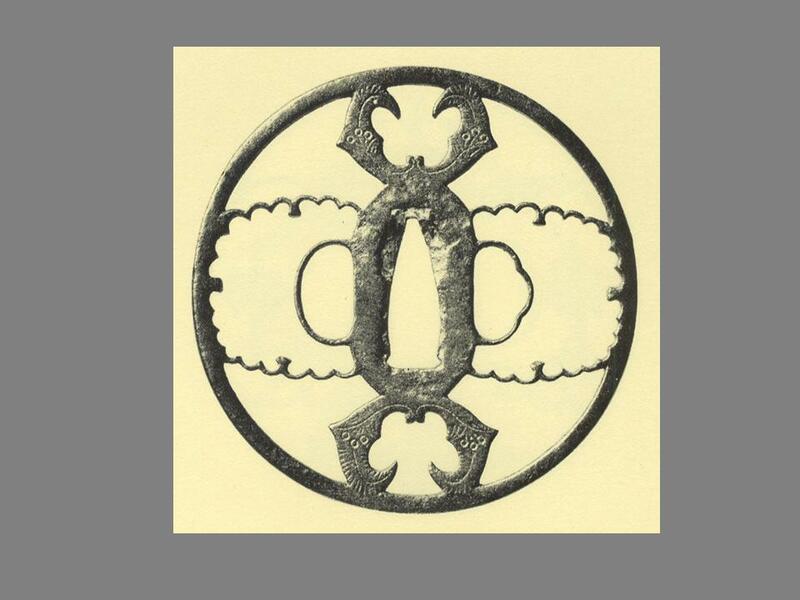 This Kyo-sukashi tsuba is late Muromachi (Sasano, 1972, #25) it is 8.30 x 8.20 x 0.45 (seppa-dai) 0.40 (rim) cm, and described as a “squared rim”, has the symmetrical ginger and snowflake design and “the characteristics of Kyo-sukashi works……but some Owari influence”. 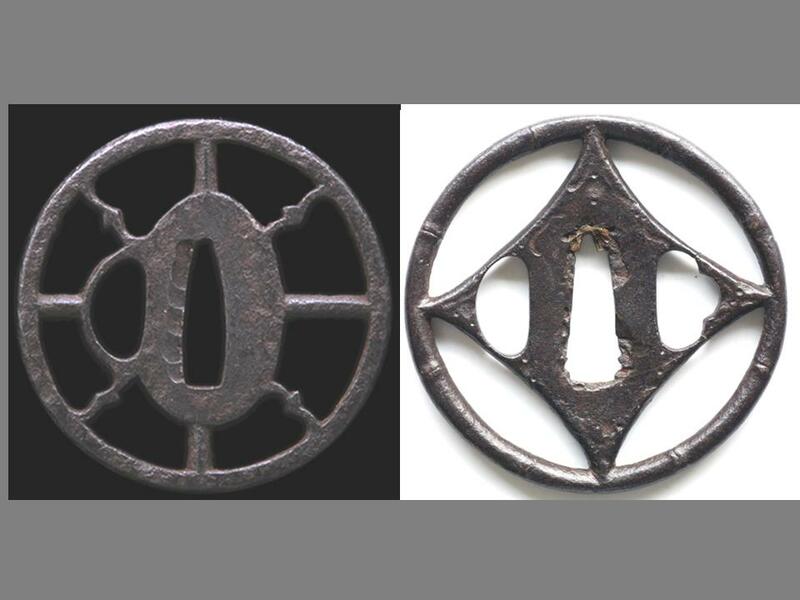 Kyo-sukashi tsuba of mokko gata, maru mimi, symetrical ji-sukashi design of pairs leaves, top-bottom design of san gai hitsu (3 diamonds) known as matsukawa hishi, mumei, 8.4 x 8.3 x 0.4 cm, probably early Edo. (Identical example Tsuruwaka #36). Design has an Akasaka feel. Kyo-sukashi tsuba, maru gata, kaku mimi, ji-sukashi design of flying birds in two bands (28 in outer; 4 x 3 = 12 in inner band), kozuka and kogai hitsu ana, 7.9 x 7.7 cm, mumei. Middle Edo period. 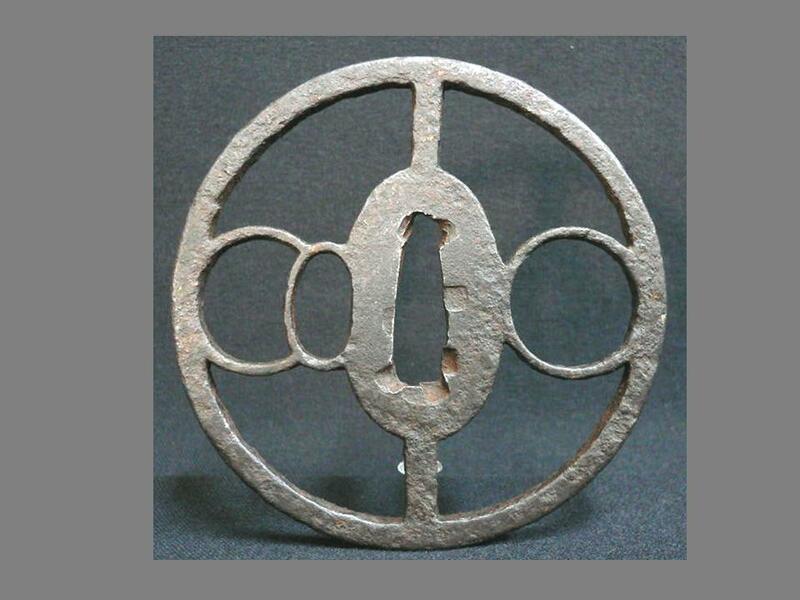 Ko-shoami tsuba with 8 sides, of ji sukashi design of shiho kari (wild geese in 4 directions), and geometrical cross, kaku-maru gata, square kozuka ana and suhama kogai ana, 7.4 x 7.3 cm, early Edo. Ji-sukashi tsuba, maru gata, kaku mimi, kozuka hitsu ana, mumei Shoami (Ko-shoami? 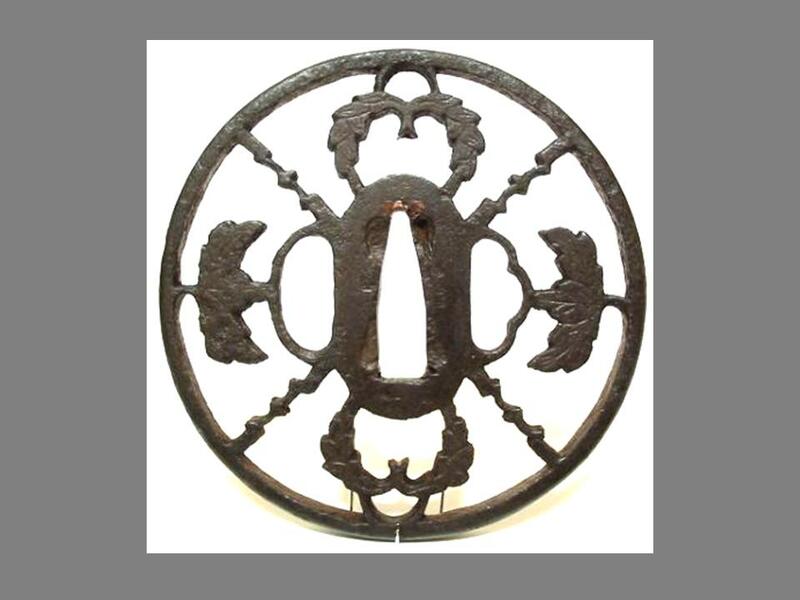 ), quite thick 7.6 x 7.6 x 0.60 cm, design of cartwheel of 12 spokes (wheel design is often called kuruma sukashi; a cartwheel is sharin) and 3 kamon of cranes (tsuru), mid-Edo period. 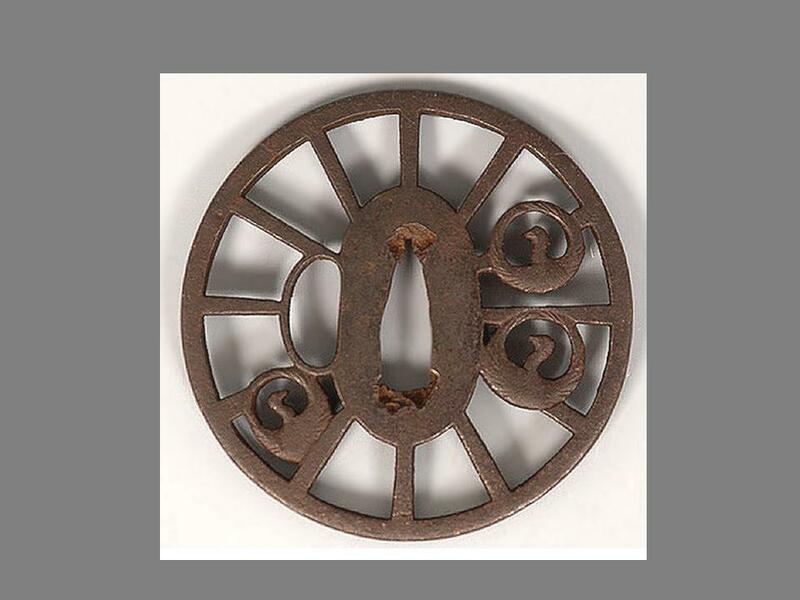 Maru gata, kozuka ana and kogai ana, kaku-maru mimi, 8.00 x 8.00 x 0.45 cm, ji-sukashi of winter theme with umbrella and snow flakes in snow storm (ukiwa myo, snow circles), mid-Edo [example in Tsuba no Bi, #26, p.230 described as Kyo-Shoami]. An almost exact copy is shown in Tsuruwaka (1998, p.41) by yondai Ishikawa Kinai (early-mid 1600’s), with omote mei “Kinai” “Echizen no Ju”, showing strong influence of Kyo-shoami on Ko-Kinai work. A subtle difference with this one, is the flying bird between the seppa dai and the top snowflake. Maru gata, kaku mimi, kozuka ana and kogai ana, 8.1 x 8.1 x 0.55 cm, mumei, ji-sukashi design of utensils for the tea ceremony (sado). Both gold and silver zogan. Has features of both late Ko-Kinai and Kyo-Shoami, but not confirmed. Items (clockwise from top): tea caddy (chaki), iron chopsticks (hibashi) to arrange charcoal, tea cup (chawan), iron water urn or kettle (kama), feather (habouki) of crane or bustard to sweep ash, stirring whisk (chasen) and sweet cake (wagashi) eaten before ceremony. Sukashi tsuba of Kyo-Shoami style, maru gata with irregular rim (kawari gata), kozuka ana and kogai ana, maru-kaku mimi, 8.10 x 8.00 x 0.50 cm, mumei, yo-sukashi design of plum tree and blossoms (ume). Possibly of Iyo Shoami school. A very similar one has been seen 8.0 x 7.9 cm, with mei “Yo-shu Matsuyama” “Shoami Moritsugu” which is given the date Genroku period (1688-1704). 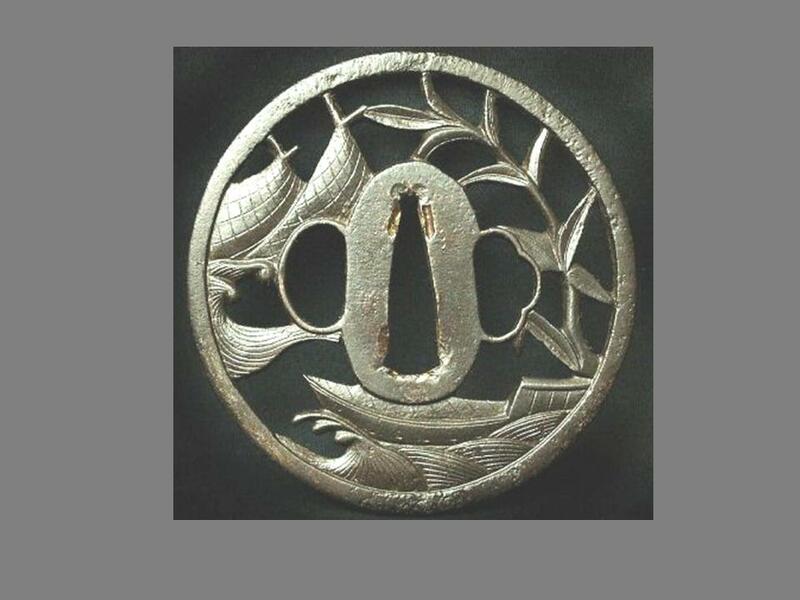 Kyo-Shoami style tsuba, maru gata, kozuka ana and kogai ana, maru mimi, 8.00 x 7.95 x 0.45 cm, ji-sukashi design of leaves of aoi (hollyhock) and water plantain (shogungusa), with three birds flying over waves. 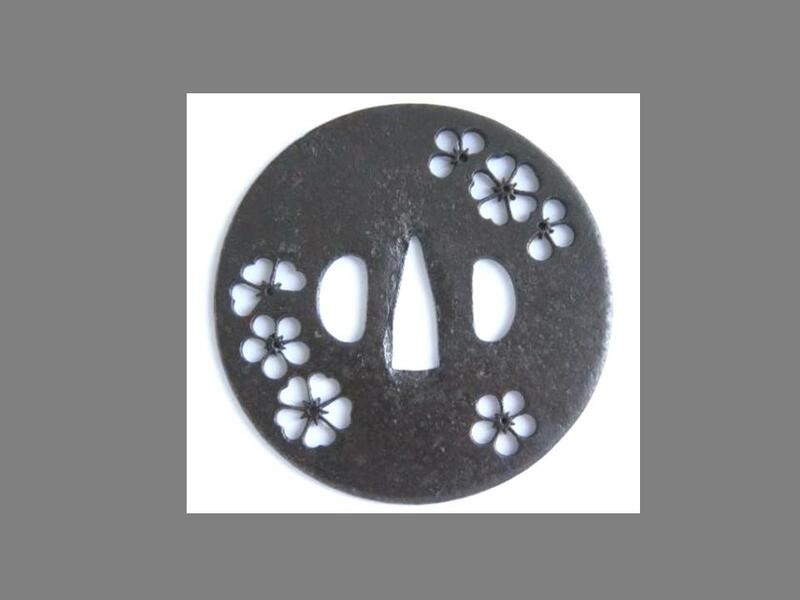 Tsuba is mumei but similar to work by earlier Echizen Kinai of early Edo. Maru gata tsuba of Kyo-Shoami style, kaku mimi, kozuka and kogai hitsu ana, 7.9 x 7.7 x 0.40 cm, ji-sukashi design of leaves, boat, waves, and straw roofs (typical of cold places with snow such as Hokkaido) three birds flying over Mumei but similar to earlier Echizen Kinai. Maru gata, kozuka ana and kogai ana, maru mimi, 7.80 x 7.70 x 0.40 cm, ji-sukashi symmetrical design of leaves and branches, in Kyo-Shoami style, mid-Edo. Maru gata, 7.83 x 7.83 x 0.47 cm, kozuka and kogai hitsu ana, slightly square maru mimi, wide rim, nikubori sukashi design of single kabu (turnip) and leaves, mumei Kyo-Shoami, early-mid Edo. Kabu (or kabura) is one of seven herbs (nanakusa-gayu) mixed in a “soup” and eaten on 7th January to prevent illness. 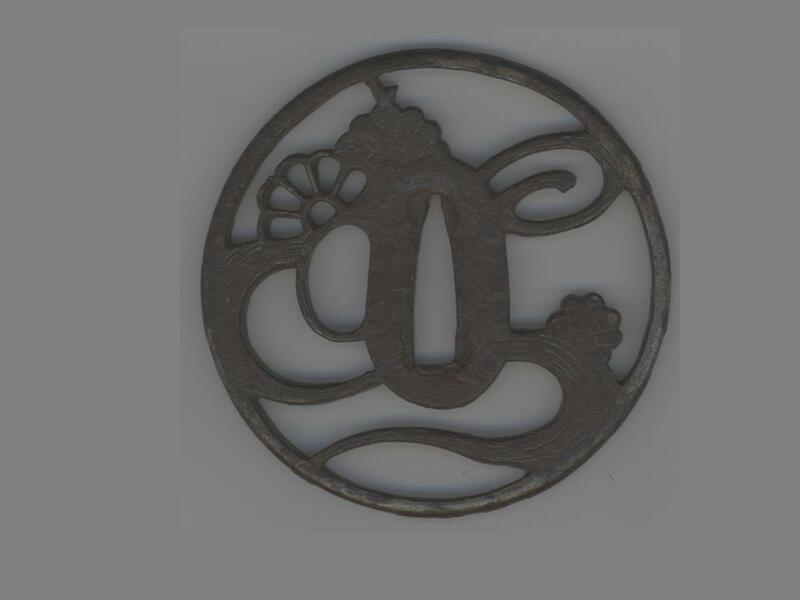 Various designs of kabu are used in family kamon (e.g. Tsukahara). Maru gata, maru mimi, kozuka and kogai hitsu ana, 8.1 x 8.0 x 0.45 cm, ji-sukashi design of 5 leaves of gingko tree (ichou ha), mumei, probably Kyo-Shoami, early-Edo period. Gingko leaves are also used in some family crests. Maru gata, maru mimi, open kozuka ana, kogai hitsu ana, 8.36 x 8.21 x 0.46 cm, ji-sukashi design of 3 hozuki (houzuki) flowers, leaves and a bud (these flowers are bright red, and also called Japanese/Chinese lantern plant, or ground cherry). 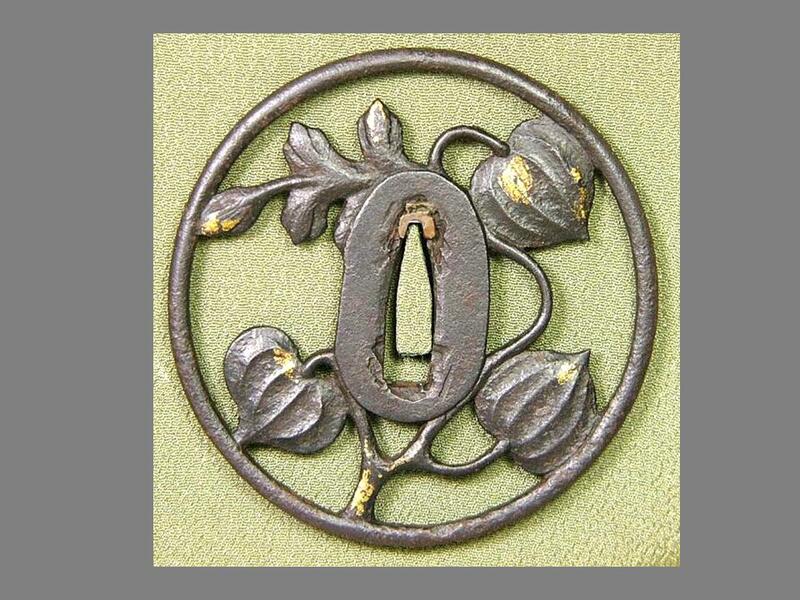 Some gold foil trim, mumei, Kyo-Shoami, early-mid Edo period. This plant is a symbol of the start of summer when it is sold in the market. There is a well known festival from the Meiwa era (1764-1771) in Asakusa (Hozuki-ichi) on 9-10 July with many stalls. The flower can be dried and the fruit inside removed. The green plant was used in old times as a Chinese herbal medicine. 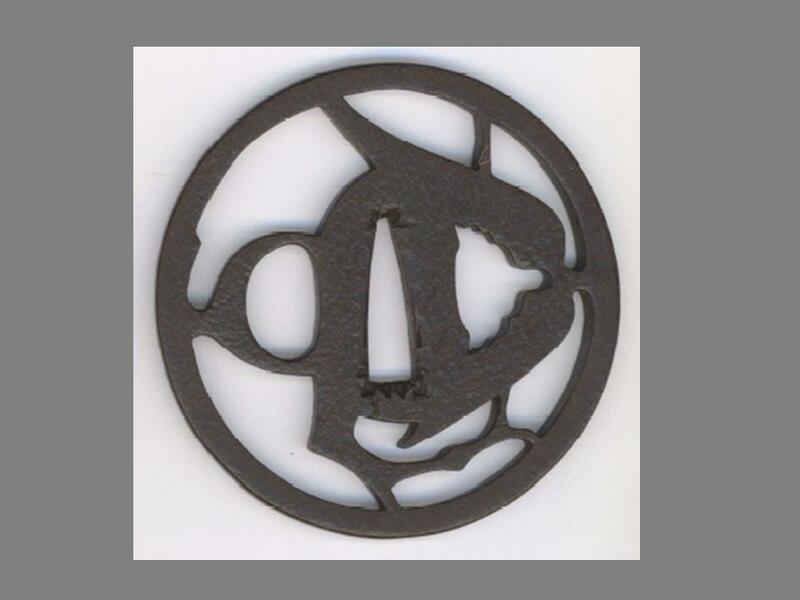 Ji-sukashi tsuba, maru gata, maru mimi, kozuka hitsu ana within design, 8.3 x 8.3 x 0.6 cm, design of rat (ne) and raddish (daikon), mumei, Kyo-Shoami, early-Edo period. Owari tsuba, maru gata, kozuka and kogai hitsu ana, kaku mimi, 9.10 x 9.10 x 0.45 cm, ji-sukashi design of four aoi (hollyhock) leaves, late Muromachi period. 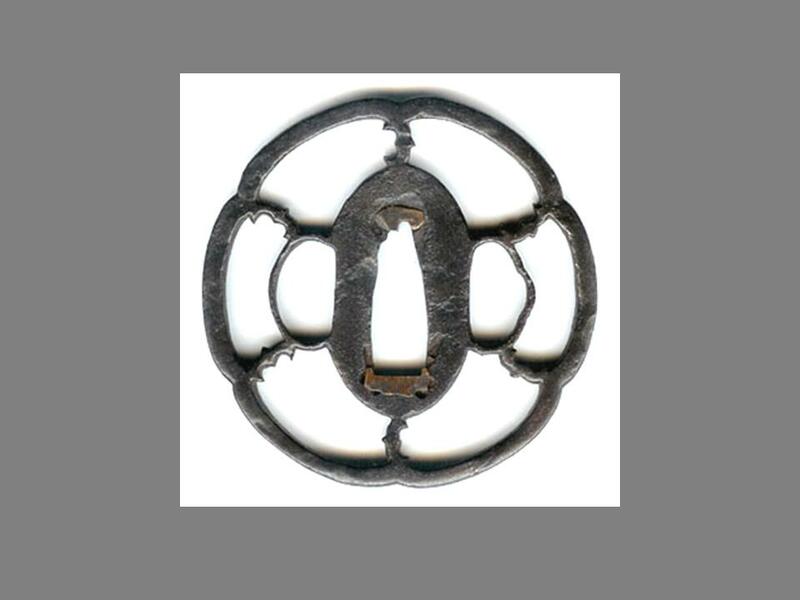 Shows a typical symmetrical design of the early Owari tsuba, and the squarish top and bottom of the seppa-dai of earlier Owari. Tekkotsu common in the rim. 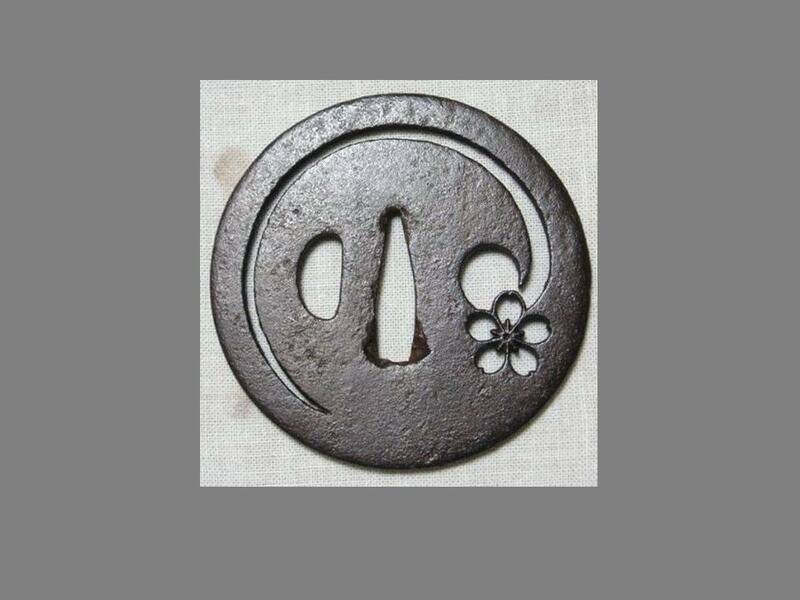 Owari tsuba, ji-sukashi, maru gata, kozuka and kogai hitsu ana, maru mimi, 8.1 x 7.9 x 0.4 cm, design of eight blossoms of kiri (paulownia) which was the mon of several old clans. Probably late Muromachi to early Edo period. 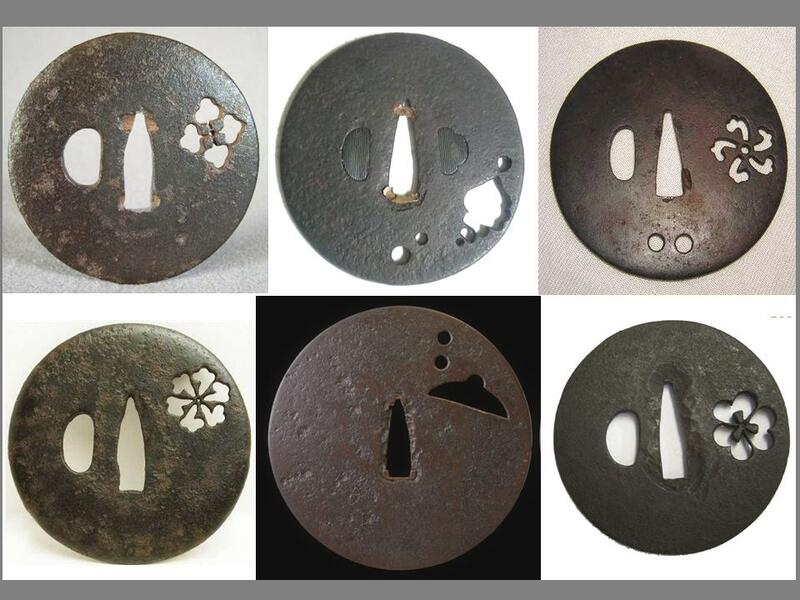 Owari tsuba, maru gata, maru mimi, kozuka and kogai hitsu ana, 8.3 x 8.2 x 0.5 cm, symmetrical ji-sukashi design of pair of kiri leaves (paulownia) left-right, pair of ginger blossoms (myoga) top-bottom, on diagonal 4 flying geese (karigane). Probably early Edo period. 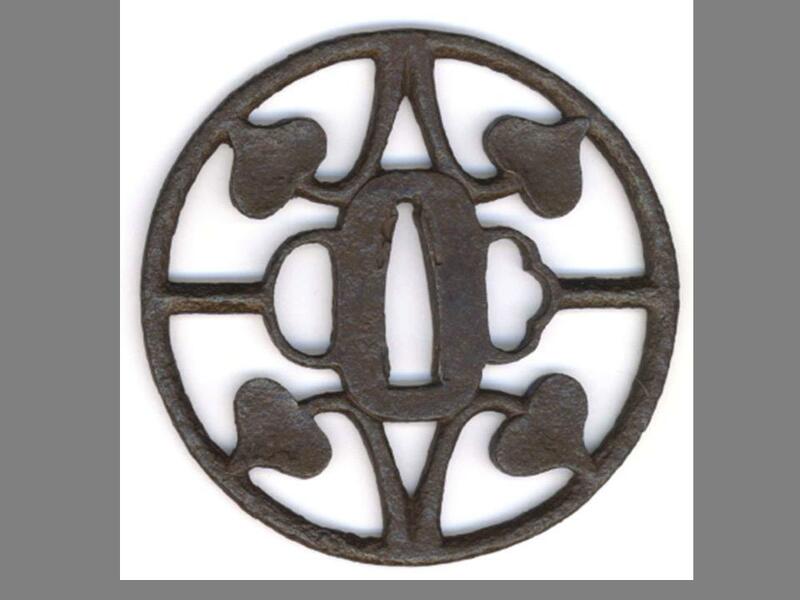 Owari sukashi tsuba, maru gata, maru mimi, kozuka and kogai hitsu ana, symmetrical ji sukashi design of two kiri mon and two pairs of water plantain (omodaka/shogungusa) leaves, 72.3 x 71.8 x 0.5 cm, probably early Edo period. 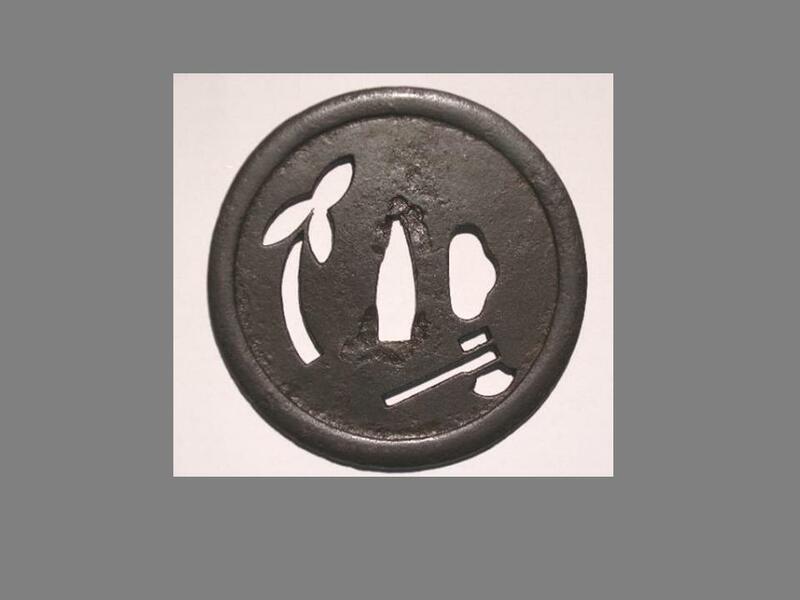 Ji-sukashi Owari tsuba, maru gata, maru mimi, kozuka (larger) and kogai hitsu ana, design of two pounders or pestles (kine) for making rice cakes, with rice cakes on skewers (dango), 72.0 x 71.2 x 0.45 cm, probably early Edo period. 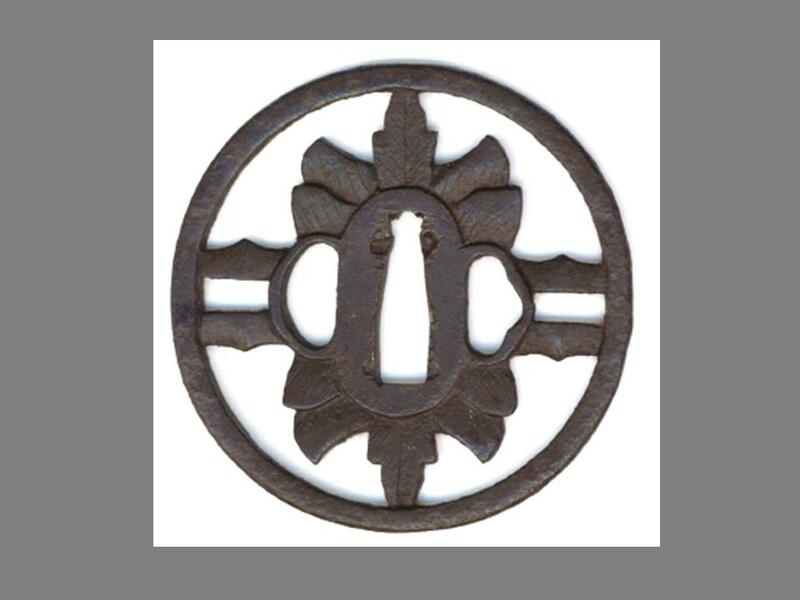 The kine design is also used in a kamon. 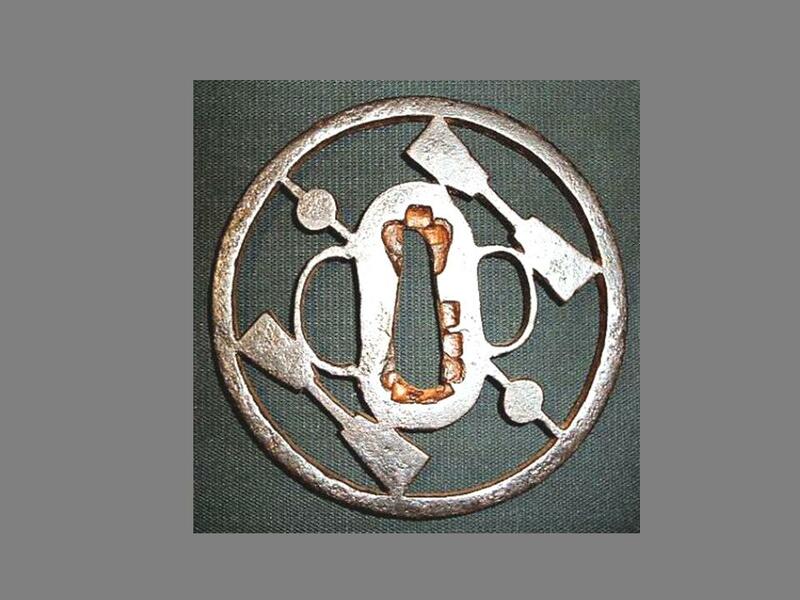 Ji-sukashi tsuba, maru gata, maru mimi, kozuka and kogai hitsu ana, kage-sukashi design of three tomoe (comma), 8.7 x 8.5 x 0.5 cm, probably Owari of early Edo. 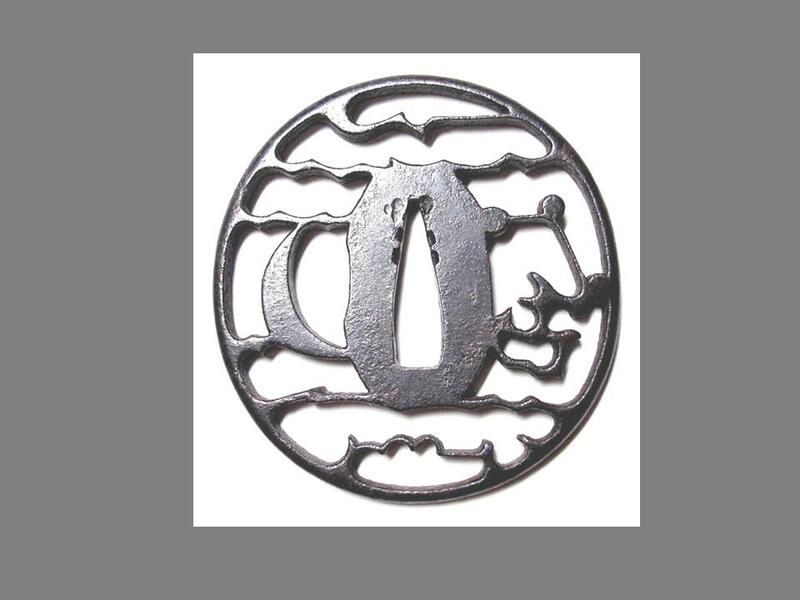 The tomoe design is also a kamon. 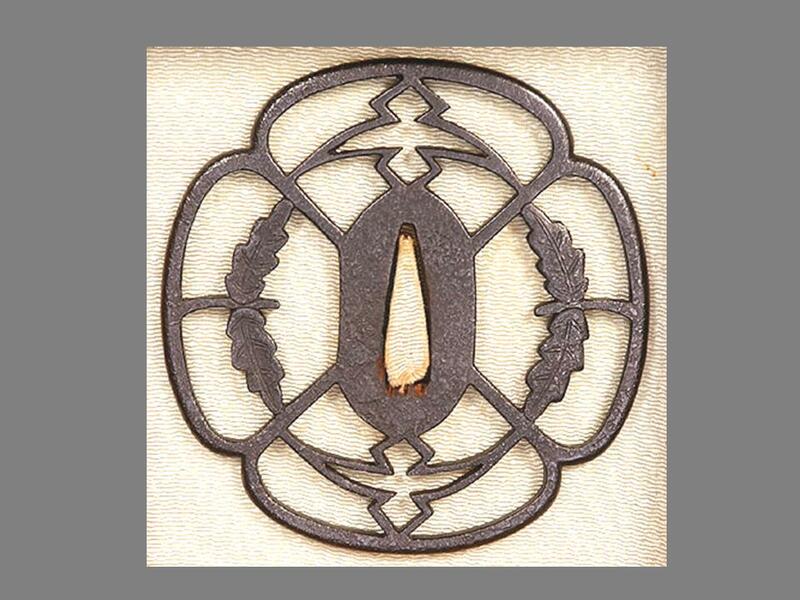 Owari tsuba ?, five lobes, kozuka and kogai hitsu ana, maru mimi, 7.80 x 7.80 x 0.40 cm, ji-sukashi design of cherry blossom (sakura), early Edo. Ji-sukashi maru gata, kaku mimi, kozuka hitsu ana, 8.40 x 8.30 x 0.45 cm, geometric design of two circles (wa) which could have many meanings, but could also represent a kamon, probably Muromachi-Momoyama period. Likely to be Owari work, but similar to some Kanayama work. Left: Owari tsuba maru gata, kaku mimi, kogai hitsu ana, symmetrical sukashi design of four spokes, and four flying birds, mumei, 6.6 x 6.6 cm. 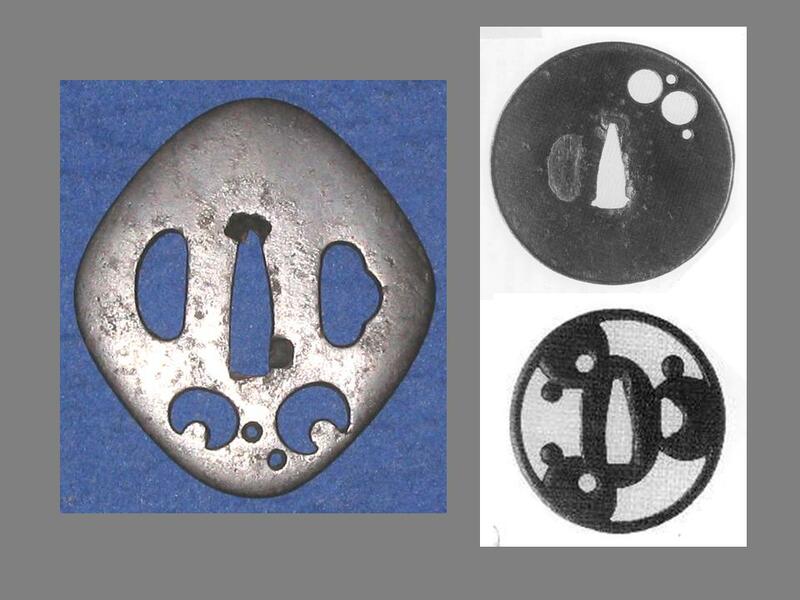 Right: Owari school tsuba, maru gata, maru mimi, rim has design of ?bamboo (take), and geometric sukashi design of a square (possibly a mon), two hitsu ana, mumei, 6.6 x 6.5 cm. 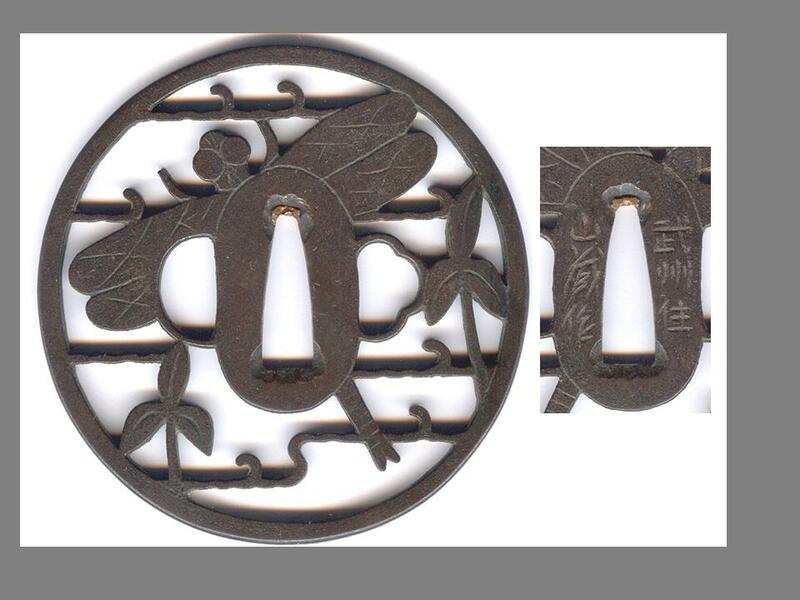 Sukashi tsuba of three lobes (mitsu wa), round kozuka hitsu ana, kogai hitsu ana is two piers (ni kai hitsu), (these diamonds are called hi-shi), maru mimi, tanto size 6.51 x 6.5 x 0.43 cm, possible Owari, but has Akasaka feel, early Edo. 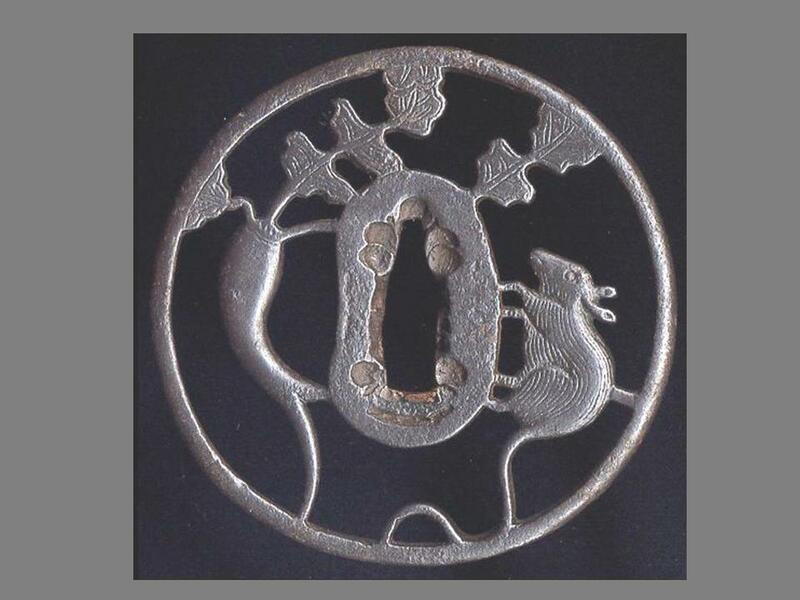 Ji sukashi tsuba of tanto size, muttsu mokko gata, design of 6 lobes, with six flying geese (gan), incorporating kozuka and kogai hitsu ana, maru mimi, 6.4 x 6.5 x 0.6 cm, quite thick, mumei, probably Kanayama, early Edo. 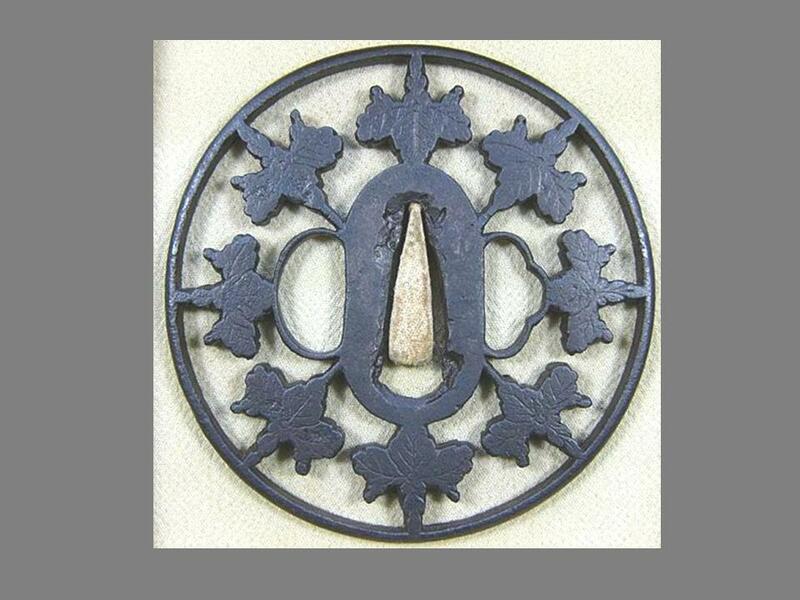 Kanayama style tsuba, maru gata, kozuka and kogai hitsu ana between two leaves, kaku mimi, 8.10 x 7.90 x 0.45 cm, ji-sukashi design of leaves and branches bamboo (take), leaves have edges eaten by insects, mottled surface of iron plate, late-Edo. 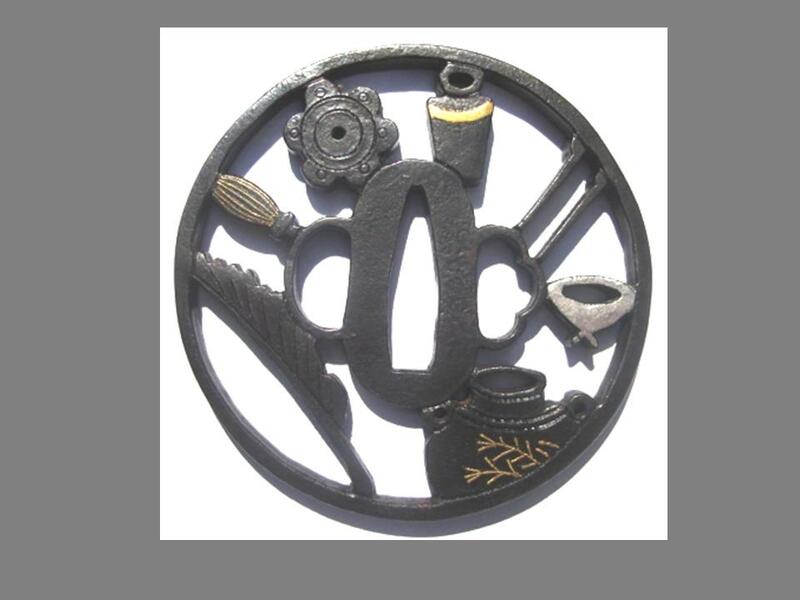 Circular tsuba of kawari gata (irregular shape), maru mimi, ji sukashi design of dead branches (kare eda), mumei Akasaka, thick tsuba 7.5 x 0.5 cm, mumei, shakudo lining on hitsu ana. Maru gata tsuba slightly nademaru, maru mimi, ji sukashi design of cresent moon, 3 stars or 3 lights (san mitsu) and clouds, mumei Akasaka, 7.3 x 6.9 cm, similar to work of yondai or godai Tadatoki. 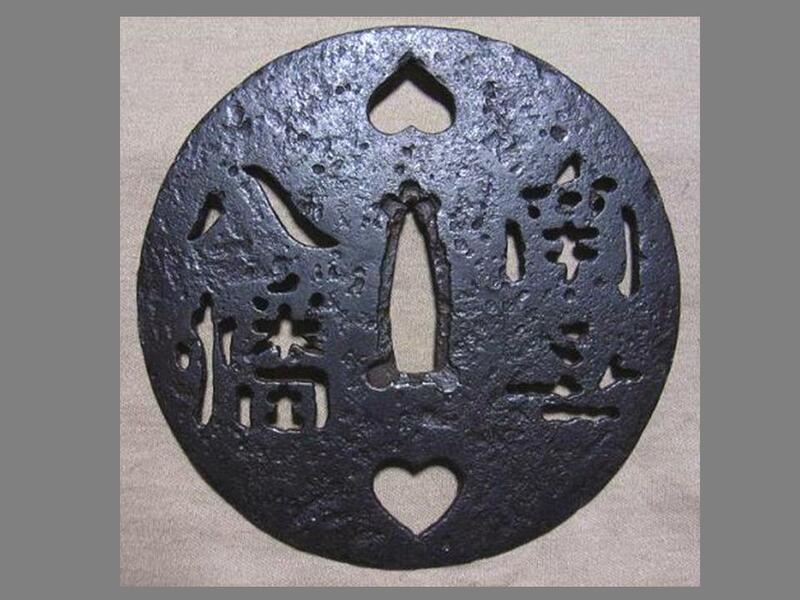 Maru gata tsuba, maru mimi, ji sukashi, 7.8 cm, mumei, design of flowing river, with floating kiku flower in kage-sukashi and two in yo sukashi. Kozuka hitsu ana. Considered to be of Akasaka school, and could be sandai Tadamasa of mid Edo. 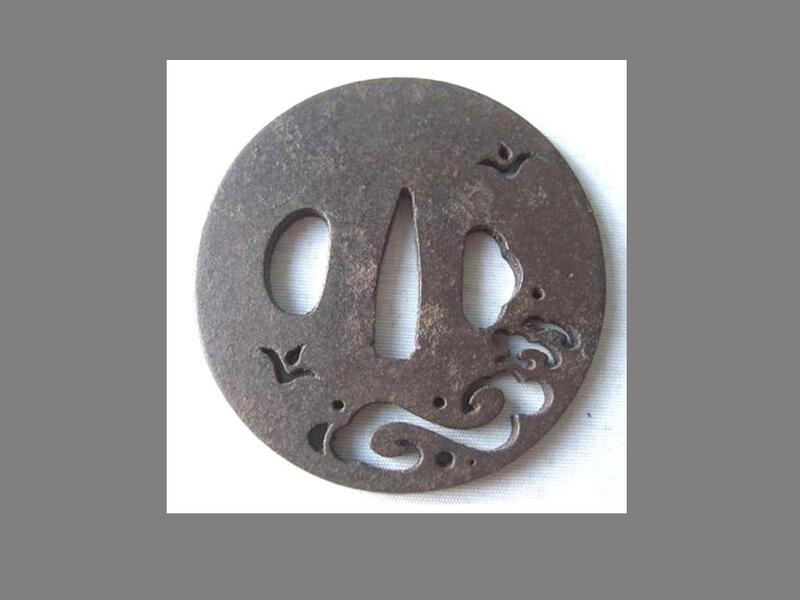 A nice tsuba which unfortunately has been burnt. Bushu tsuba, maru gata, kozuka ana and kogai ana, kaku mimi, 8.45 x 8.35 x 0.40 cm, ji-sukashi design of dragonfly (tombo) over water with some water plantain (omodaka) leaves, ura mei “Bushu no Ju” “Yamakura Saku”, looks like some Akasaka examples, very late-Edo (Bunkyo era 1861). Maru gata tsuba, rounded kaku mimi, ji sukashi, 8.6 x 8.6 cm, kozuka and kogai hitsu ana within design of leaves and berries. Omote mei “Kishu no Ju”, “Sadanaga”. The shodai Sadanaga was a tsubako around Kanei (1624+); he was of the Hoan Kei in Kii no Kuni, and a pupil of Kawaguchi Hoan. When Hoan’s family moved to Aki, he remained in Kishu; he lived in Wakayama. There were two generations, this is the shodai. Their work commonly was plain sukashi in thick tetsu ji. (image from Sujikabuto on esnips). Maru gata tsuba, kaku mimi, 7.5 x 7.5 x 0.6 cm, kozuka and kogai hitsu ana within ji sukashi design of two carpenters squares (kakudo jyogi). Omote mei “Kishu no Ju”, “Sadanaga”. 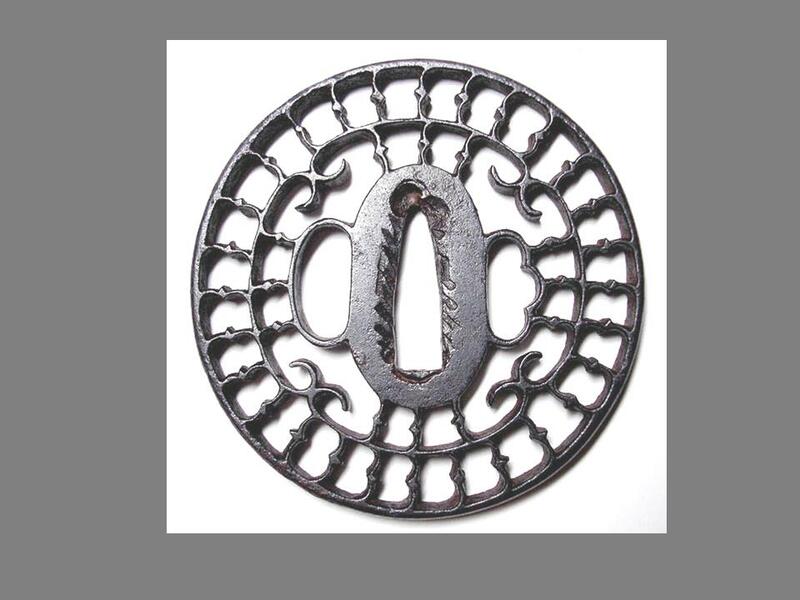 This is probably work of nidai and shows typical thick tsuba of strong angular design. Maru gata tsuba, kaku mimi, ji sukashi, 8.2 x 8.0 cm, kozuka and kogai hitsu ana within design which is probably keys. Appears to be ura mei, by shape of hitsu ana, “Kishu no Ju”, “Sadanaga”. 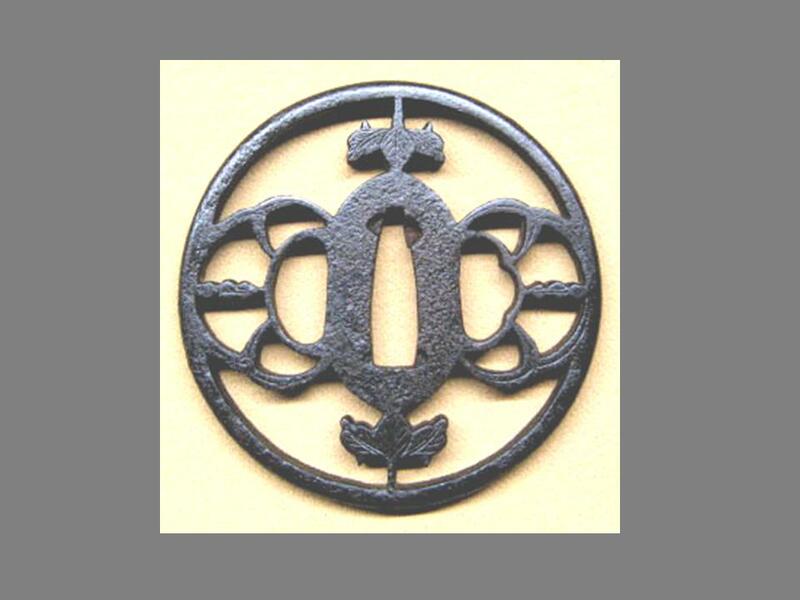 This tsuba is by the later generation, of late Edo, in the plain style.